It is hard to bet against the .com extension. Even the most strident supporter of alternate GTLD's and CCTlds will concede that the .com extension's brand power is hard to undo. Too many sites have been built there, too much money has been spent on global branding. Think of every business card in your Rolodex, every yellow-pages ad, every billboard, bus-bench, TV and radio spot. Dot Com (and the CCTld of the Non-US Country you are in) bubbles-up through the collective conscience of all people who think: "Internet". Funny thing is, a lot of poignant, generic .com names don't get very much organic type-in-traffic each (considering how meaningful they are). Take a name like CrossStitchPatterns.com. That name has enormous resonance. 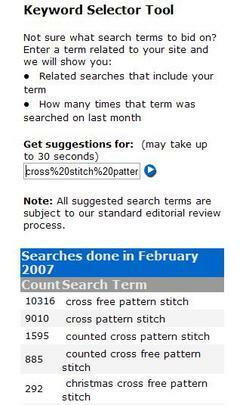 While you and I may not be logging on anytime soon to seek out Cross Stitch Patterns; in the Month of February, 9010 people searched for that phrase across Yahoo's network. That's more than 300 people a day seeking out that search phrase at assorted third party search-pages powered by Yahoo (and at Yahoo.com itself). Compare that to the 4 unique type-in visits a day this name generated on its own. Don't cry the blues for the name's owner. 4 consistent type-in visits each day on a generic name like that is actually quite good. These visits come for free, without referrer -- based purely on type-in to the address bar as a result of this name's meaning and resonance. You can not get less visits to this name as none come via the search engine, the only way is up. 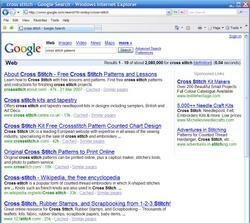 So I searched "Cross Stitch Patterns" at the leading search engine and noticed the paid search advertising on the right side. These are advertisers who want to buy traffic under the matching cross stitch key-phrase. As I reviewed the URLs of the advertisers, none of them contained "Cross Stitch Patterns" .. we have michellesneedlecrafts, adventures-in-stitching but no exact match for the search string. What do you suppose would happen if I advertised my URL under the key-phrase that matches the name? Well, I tried it and I found that because my URL matched the key-phrase people were searching for, I had to bid less for traffic. People were more apt to click on a link when it matched the URL.. and the power of .com just reaffirmed to Jane Public that she had found the market leader. The same psychology that makes a great domain name get organic type-in visits, helps the advertised URL to get the attention of the shopper in a search marketing setting. It is difficult to change human behavior. I went through this little dog and pony show to illustrate my belief that in a few years time the worlds largest SEM, traffic arbitrageurs will be those who own large portfolios of type in traffic domain names with high Overture counts (keyword apart). Why? Because if you get four organic visits across hundreds of thousands of domain names, you will be in a far better position than a naked arbitrageur to take-on a few thousand arbitrage plays paying 35cents at Google and selling to another market/advertiser for as low as 35.5 cents .. The naked arbitrageur without the type in traffic domain portfolio has no cash-flow driver to prime the pump and compete at lower margin levels. It would drive them out. Couple that lack of organic cash-flow with the fact that the keyword-weight of high search-volume domain names will always help their owner to draw more clicks in an arbitrage setting (and ultimately pay less for traffic because search algo's reward sites drawing more clicks) and you can see why I say; the house always wins. Buy generic keyword domain names with type in traffic (and high "apart" search counts, cuz that's where the searches/people are) and you 'become the house'. Frank, i did similar research in adwords using dozens of different name types in my industry and tested .com, .net, .org, .info, .biz and .us against eachother. i spent a couple thousand dollars doing this. it turns our that .org sometimes outperformed .com and in some situations .info performed as well any other extension. the .us also performed reasonably well. i'd rather have the .com's of course for the obvious reasons, but i got in the game a bit late. there's another reason to own exact match names apart from arbitrage - the same advantage they enjoy in adsense will boost their performance in the organic search rankings (more clicks for the same search ranking for anyone doing development). my own theory is that this can even offset the leakage from a .org to .com. but it's still just a theory. one, i will be testing later this year. very glad to hear your thoughts on this matter as it helps me justify thousands and thousands of registrations that are way underwater - LOL. ***FS*** Ha ha .. glad to make you feel better about names without traffic. I will say though.. if you have the correct order "free psychic readings" as opposed to "psychic readings free" you will clearly do better.. the url has to match the user intent as they typed the string. That goes back to the human behavior part. This goes for singulars and plurals too IMO. Interesting color on the .org names. I think in a com/org head to head arbitrage battle com would win. Org folks wouldn't convert as well because they are looking for "freebie info." I want people with wallets open.. so do advertisers. But still orgs may work better for religion/charity categories. > the power of .com just reaffirmed to Jane Public that she had found the market leader. ... on the other hand, the first thing that a site visitor is likely to see is your site's URL. So in a field where 50 companies offer basically the same service, owning the exact generic domain corresponding to that service is like setting up business at the heart of the most prosperous district of a real-world city. C-R-E-D-I-B-I-L-I-T-Y. It's a lovely word! You can (perhaps, for a time) buy it with millions in advertising dollars and huge extravagant campaigns, or you can outflank all your competitors, big or small, by grabbing the mindshare of your visitors even before they set a virtual foot on your site by securing that perfect URL. Once companies start to realise this en masse as opposed to the current dawning realisation of a few earlyish adopters, this already crazy market is going to head for the skies. If CrossStitchPatterns.com gets four real uniques a day and assuming the traffic is being sent to Yahoo, then the owner of that domain controls .0133333333 of Yahoo's total traffic for Cross Stitch Patterns. That is assuming Yahoo gets 300 uniques a day. I'd take that 1+ % marketshare anyday - owning one percent of the market share a big ol' search engine has for a particular niche. The owner should be proud to own it. In reality it's a silent coup that some domain owners may not realize is ocurring with their domain purchases. Imgaine what those few extra percentage points we cumulatively own could mean to Yahoo, Google, or MS when competing against each other. Talk about a competitive advantage ; I believe you mentioned this already Frank about what Google did with locking down AOL with a percentage buyout. This really seems like a possible future scenario. I think you are underestimating the power of cctlds for the specific markets they represent. The same argument you apply for .com domains also applies for a particular cctld in their own market. They are much more likely to click on the domain that reflects their country. One of the reasons is localization(this includes dealing with local companies, wanting a website in a particluar language etc.) and the second reason is that in some cases they are just more use to dealing and typing in cctlds as they more prevelant in their particular country. One last point I'd like to make is the traffic leaks between .com's and cctlds flow both ways. you are right about the .info and the .us -- no traffic. but the .org names have some reasonable traffic and in employment and healthcare (my areas of interest) the intent factor isn't quite the same. however, the biggest problem with a name like browardjobs.org is that the parking companies don't display ANYTHING relevant to the visitor .
" That's more than 300 people a day seeking out that search phrase at assorted third party search-pages powered by Yahoo.... "
" 4 consistent type-in visits each day on a generic name like that is actually quite good. " 9010 total searches a month divided by 30 days in a month = roughly 300 searches a day. Frank knows how much type-ins a day (4) because that he currently owns the domain. My question is: do i have the legal rights to get all the typos of my domain name meetpeople.com such as meetpoeple.com, etc. for free? How do you calculate the type-in traffic? is it just the direct hits under the referrer tag? I wondered what you thought of other extensions like net org and info when it comes to arbitrage PPC ads. For example isn't it better to have GreenWidgits.info than WeSellGreenWidgits.com at the URL for your PPC ad at Google? I thought there might be a lot more available domain names for the arbitrage game in other TLD's & ccTlD's. ***FS*** I like .info and .org in that scenario in certain circumstances.. For example: charitablename.org is better than .com also healthname.org can be more potent at drawing a click. But .com will typically draw more clicks in nearly every other circumstance for the same reason that people type the name in their browser. It is in the collective conscience and deemed authoritative. I believe that this is the kind of prospect where development is the key. It is clear that whilst people are very happy to Search on three word combos they are much less likely to type them in. At the same time the competition to get to the top of search through good development and SEO, is going to be manageable. The domain should give you the boast you need to get visible without massive investment. Providing content for this sort of site should also be a doddle. Front page needs to be little more than an index so providing Advertising Space on the front page should not be too much of an issue. This case study does highlight the difference in the quality of prospects in ASCII dot coms and IDN. Nobody in their right mind would have drilled down to complexed terms like this for IDN. I bet the equivalent of Pattern is still available in dot com in a lot languages let alone Cross-Stitch. ***FS*** There's not really an exact science to it.. so much is subjective.. and I certainly don't always get it right. Try to look for meaningful generic things (in the correct tense) that get over 1000 apart. What if I aquire a keyword matching domain and forward it to my primary web site. Will this still be of benefit for an ad in terms of CPC bid? ***FS*** Refreshing a domain to another domain often causes traffic potency to decrease. It's the same reason Search Engine conversions are lower than direct navigation. Better to title the page after the domain to reafirm to your visitors that they have found the right thing they were looking for. Thanks for the great blog, it's fascinating and inspiring. I'm a newbie with a question showing just how new: what is an "apart" search? To me owning the generic search term - even with hyphens and .info seems to be the real deal. The guy on spot one with only a partial match paid 300K for his spot and domain.